We have for years remarked about people coming to such events primarily to see what an old man looks like. To see a ninety-year-old in real life must surely be an irresistible temptation! But thank you very much for being here. Your warmth and friendship are much appreciated. We feel privileged to celebrate with so many friends and well wishers. As the years progress one increasingly realises the importance of friendship and human solidarity. And if a ninety-year-old may offer some unsolicited advice on this occasion, it would be that you, irrespective of your age, should place human solidarity, the concern for the other, at the centre of the values by which you live. There is still too much discord, hatred, division, conflict and violence in our world here at the beginning of the twenty-first century. A fundamental concern for others in our individual and community lives would go a long way in making the world the better place we so passionately dreamt of. I thank you once more for honouring an old man with your presence. 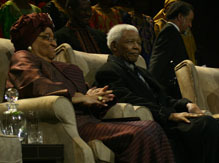 And I thank particularly President Johnson-Sirleaf for agreeing to deliver this lecture. You are an inspiring example to Africa and the world as one who strives for peace where others seek to fight and destroy. We salute you for your courageous example. Click here to download a pdf version of President Johnson-Sirleaf’s Annual Lecture address.